forehead of the sleeping people, the poem is a constellation of blood. Tormented, visionary Mexican surrealist painter, writer. Ceylon: FESTIVAL OF BUDDHA'S EYETOOTH. Continues for days. Most processions at night. Painted jeweled elephants, leaping dancers, costumes, drumming, spinning prayer wheels. England: KETTERING FEAST DAY: sadly no longer celebrated; in its day the revels were marked with blindfold wheelbarrow races & much gurning — grinning through a horse collar (the funniest wins). NATIONAL REFUSE JUNK MAIL DAY. Mark "REFUSED" on unopened junk mail, & return it to the Post Office (i.e., put it back in your mailbox for return). 699 -- Death of St. Sexburga. 1415 -- Jan Hus burned at the stake. 1535 -- England: More is Less? Sir Thomas More beheaded by order of Henry VIII. 1535 -- England: Auntie Utopia? Sir Thomas More (author of Utopia ) is beheaded for (second day in a row!?) refusing to acknowledge Henry VIII as the supreme authority of the Church. 1699 -- New Old World: Captain William Kidd, a New York businessman turned pirate, captured in Boston & deported back to Vermont (that stateless wonder). 1699 -- New Old World: Besieged for three years, Acoma Pueblo (New Mexico) finally submits to the Spanish, who attempt to change its name to something more Christian & tasteful. 1747 -- John Paul Jones, "I have not yet begun to fight," begins fighting. 1798 -- US: Alien & Sedition Laws makes noncitizens "liable to be apprehended, restrained,... & removed as alien enemies" (3rd Alien Law). Inspires X-Files TV series. Sometime during this month [I don't have exact date — ed.] Illegal Oaths Act, now makes it a capital offense to give oath. Also, Preservation of the Public Peace Act; until 25 March 1813 gives magistrates power to search for arms & to disperse assemblies without the Riot Act formalities. Sometime during this month [I don't have exact date — ed.] Masters secretly combine to flood work place with disbanded militia in Leics, Notts & Derby, causing the collapse of Henson's Society, which was started in 1813. 1829 -- 20-year-old Alfred Tennyson gets a prize for his poem "Timbuctoo" at Cambridge. 1858 -- Godfather of Sole? : The shoe manufacturing machine is patented by Lyman. 1859 -- Verner von Heidenstam lives (1859-1940). Swedish poet/prose writer, snagged the 1919 Nobel Prize. Represented literary reaction to the naturalistic movement in Sweden, calling for a renaissance of the literature of fantasy, beauty, & nationalism. In his youth he lived in Egypt, Syria, Palestine, & Greece, & his exotic experiences mark his early poems. His most popular novel is The Charles Men . 1878 -- Eino Leino (1878-1926) lives. Finnish poet / bohemian, master of song-like poetic forms, playwright, & novelist. Leading Finnish writer of the early 20th century & now perhaps Finland's most cited poet. 6è i últim congrés of fracció Bakuninista of l'AIT (International Workingman's Association, the first Communist International). Between els assistents i organitzadors emphasizes Kropotkin & Malatesta. 1885 -- First inoculation (for rabies) of a human being, by Louis Pasteur. 1890 -- England: Gasworkers victory parade; 25,000 people wound onto Hunslet Moor to celebrate the success of the strike. If the failure of direct action threw the socialists into the hands of the moderates, the lesson that anarchist H.B. Samuels learned from the results of the street fighting was very different. Gas stokers with poles & people armed with stones would never be enough to withstand the hussars & dragoons. The people must be armed, he thought. & that meant explosives. "If the people only had the knowledge — they certainly had the pluck — the whole cursed lot could have been wiped out," Samuels wrote, lamenting that none of the scabs or their military protectors had been killed ( "Commonweal," 12 July 1890). 1892 -- US: The Homestead Strike. Strikers battle Pinkerton thugs during the Carnegie Steel strike in Homestead, Pennsylvania. The Pinkertons, trying to import & protect scabs, opened fire on striking steelworkers. In the ensuing battle, three Pinks & 11 strikers & spectators are shot to death. Strikers militantly resist the private goons hired by Henry Clay Frick to dislodge them from plant grounds. They fought back with guns & homemade cannon. The strike held for four months, but the company was able to restore production & as winter approached morale declined. Finally unskilled workers sought release from their strike pledge, & two days later, on November 20, the skilled workers' union, The Amalgamated Association of Iron & Steel Workers, called off the strike. 1894 -- Nicaragua: US troops invade. We'll let you guess whose "interests" they were protecting. 1895 -- Faced with charges of embezzlement, & hoping to flee to South America, author O. Henry boards a train headed for New Orleans. 1898 -- Hanns Eisler lives (1898-1962). Forced to flee Nazi Germany because of the political character of his music, he later is forced to flee the US for the same reasons. "Eisler on the Go," is a song concerning Woody Guthrie's fellow folksinger Hanns Eisler, who was dragged in front of the House Committee on Un-American Activities (HUAC). 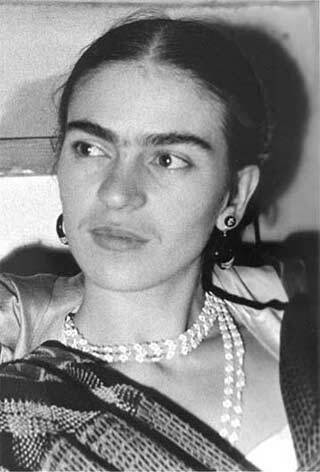 1907 -- Surrealist artist Frida Kahlo lives, México (1907-1954). Self-destructive fantastic Mexican painter, activist, (1907-1954). The Nazi occupation forced many artists to emigrate to Mexico. Key figures in the informal surrealist community there included Leonora Carrington, Wolfgang Paalen, Alice Rahon, Luis Buñuel, Frida Kahlo, Kati Horna, Benjamin Peret, Remei Varo & the young Octavio Paz. 1911 -- Anarho-sindikalisticka Joe Hill's song "The Preacher & the Slave" first appears in the Little Red Song Book . 1913 -- Welsh novelist/playwright Gwyn Thomas, lives, Perth. His work, much dealing with grim themes, marked with gusto, humor & compassion. 1916 -- German surrealist painter, writer Unica Zürn lives, Berlin, Germany. Best known for works of anagram poetry, exhibitions of automatic drawing, & her photographic collaborations with Hans Bellmer. 1919 -- Italy: Scontri a Fiume tra militari francesi e italiani : 9 morti e 11 feriti, tutti soldati francesi. Il presidente del consiglio francese Georges Clemenceau definisce gli italiani "un popolo di assassini." 1921 -- "Just say no" Anne Robbins-Davis never lives. 1921 -- US: In the Sacco & Vanzetti trial, during cross-examination, Sacco, too, is questioned at length concerning his political views. 1954 -- Elvis Presley cuts his first record. 1957 -- John Lennon meets Paul McCartney at a church picnic in Woolton, a suburb of Liverpool. In the church basement between sets, 14 year old McCartney teaches a 16 year old Lennon Eddie Cochran's, "Twenty Flight Rock" & Gene Vincent's "Be-Bop-A-Lula." 1960 -- Italy: La polizia di stato reprime duramente una manifestazione antifascista a Roma. 1962 -- Novelist William Faulkner, 64, dies of a heart attack in Byhalia, Mississippi. 1963 -- US: At some personal risk & his own expense, Dylan joins other folk singers to play at a voter registration rally in Greenwood, Mississippi. During this month his album "The Freewheelin' Bob Dylan" is released. 1968 -- US: Muhammad Ali (formerly known as Cassius Clay, boxer) asks Supreme Court to void conviction for draft evasion. 1971 -- Jazz great Louis Armstrong (1904-1971) dies. 1971 -- US: Real Drips? White House Plumbers unit formed to plug news leaks. Lousy plumbers, many leaks. 1975 -- For Colored Girls Who Have Considered Suicide/When the Rainbow is Not Enuf , a play by 26-year-old Ntozake Shange, premieres in NY City. 1975 -- Alexander Sapoundjiev (1893-1975) dies. Bulgarian student of philosophy, militant activist, participant in the founding congress of the Bulgarian Anarchist Communist Federation in Sofia in 1919. In turn, he was imprisoned by both the Bulgarian fascists & communists. 1976 -- US: 96 arrested for trespassing at Trojan Nuclear Power Plant near Rainier, Oregon. 1979 -- Marino Moretti dies, Cesenatico. His poetry is known for its focus on rural life, remembered youth, & simple pleasures. 1979 -- Composer, arranger & producer Van McCoy, 38, dies of a heart attack. Biggest mark in the music biz was "The Hustle," the biggest dance-craze record of the decade. 1989 -- France: René Lochu (1899-1989) dies Militant anarchiste, syndicaliste et pacifiste. Author, Libertaires mes compagnons de Brest et d'ailleurs (1983; foreword by Léo Ferré). Among his many friends are May Picqueray, Louis Lecoin & Aristide Lapeyre. Y'a toujours un marin qui rallume son voilier"
1989 -- US: Federal marshals & FCC sieze pirate radio station WHOT in Brooklyn. Steal This Radio is of interest; Radios libertaires is an excellent jump-off point with links. "Every animal knows, & humans are no exception, that when there is a stampede you must join in or get out of the way. Try to stop it, & you will be crushed." 1993 -- England: Women For A Nuclear Test Ban climb over wall, Buckingham Palace, London. 1994 -- Nikolas Tchorbadieff (1900-1994) dies. Bulgarian militant & anarchist propagandist. Forced into exile, he helped found the "International Bookshop" in Paris & was a founder of the French-Bulgarian review "Iztok" in 1979. 1998 -- International blockade at Temelin, an unfinished nuclear power plant presently under construction in southern Czech Republic. Using barrels, concrete tubes, their bodies. The core Czech group will be joined by hundreds from Germany, Slovakia, Poland, the European Union, the CIS (former USSR), Sri Lanka, & the US. "Since I do not foresee that atomic energy is to be a great boon for a long time, I have to say that for the present it is a menace. Perhaps it is well that it should be. It may intimidate the human race into bringing order into it's international affairs, which without the pressure of fear, it would not do."